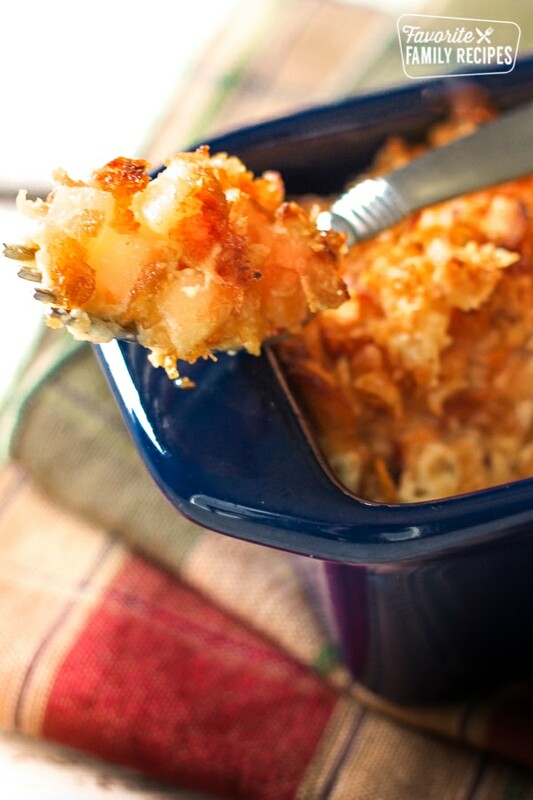 This Cheesy Potato Casserole, also known as funeral potatoes, is sure to please a crowd! I love the cheesy potatoes in every bite with the crunchy topping. There are lots of different names for these potatoes.. in Utah they call them “funeral potatoes” because they are a staple for feeding large groups of people. But this recipe is far and above the best one I have had. They make a great side dish to any meal. Some like to add shredded onions to this dish, and you can feel free to do so, but I like the potatoes creamy without the added crunch of onions. For as long as I can remember, we have always made this dish for Easter dinner. It goes perfectly with Easter ham! Sometimes we even cube the ham and add it straight to the potatoes and call it a meal! Whatever you decide to serve this with– you are going to love it! Mix hash browns, cheese, salt, and pepper and pour into a 9x13 pan. Mix butter, soup, sour cream, and milk - pour over hash brown mixture. Top with corn flakes and a little melted butter. Bake 1 hour at 350.
same question.Cube?? I use tater chips on top. Instead of pint, it is easier to say 16 oz. Maybe we use simple language in MI. I also add extra stick of butter & top with potato chips. I use the shredded potatoes instead of cubed. Add garlic powder. Always make sure they are frozen. When you mix . If your ha da are not numb your not doing it right. For a completely different taste you can add a pancake of bacon peices not bits, I mean the packages kind in the bags by the dry ranch dip mixes., and add that to the mixture or justvti the topping for a bacon crunch too. Yes you can cook your own…but why? Lays potato chips crunched up and mixed with additional shredded cheese on top is also a great topping. Keebler butter crackers or cheese it’s work too!!! i make this also, the only different thing i do, is i put ham in mine, and instead of crushed up corn flakes, i use crushed up cheddar and sour cream potato chips. this is a very good recipe, a good way to use some of that leftover Easter ham. Is a cube of butter a stick of butter or a couple of teaspoons of butter? A cube is one stick. Love this recipe, a favorite in our family for sure! My mom requested I make this for her birthday dinner this year. The only thing I do differently is used shredded hash browns. I wonder how it would taste with Panko bread crumbs. Any other variations you recommend instead of corn flakes? I use crushed up Fritos! Everyone loves it this way that has tried it! I’ll have to try Fritos next time I make this – thank you for the idea! I use crushed Ritz bacon flavor crackers….just adds that little something extra! Crushed Ritz crackers are also yummy! Yes, they are just the cubed potatoes that are small.. the ones in the frozen section of the grocery store. They are a potato grated. Do the hash browns need to be defrosted and how much butter goes with the cornflakes? I love your site because some of my favorite recipes are ones you rave about, it makes it easy to trust the deliciousness of the rest of them! Thank you for sharing your passion with the rest of us. I tried this recipe and I love the country style potatoes, better than shredded. I also love the topping, I never bothered before but my kids loved that part the best! I am making this for a birthday party, how many will this serve ? This recipe makes 12 servings. Good luck with your party! Could you think of a good substitue for the can of cream of chicken? I personally strongly dislike it, because I feel as though the chicken just taste fake. It honestly makes me sick. Thanks for any suggestions in advance! I use cheddar cheese instead of cream of chicken soup. P.s. If you don’t want the crunch of onions but still want yummy onions in the dish, I recommend sautéing the onions in oil or butter with minced garlic first until they are soft and delicious. That is a great idea – I often do this to hide the onions from my kids. Thanks for sharing! Just use your grater and grate the onion. Then they are so small that you don’t even notice them. Onion? What onion? There is no onion in the recipe? Are we looking at the same recipe? Can you make this a day ahead and store in the fridge? You can do it either way. I like them thawed first because I feel like they cook better but you can do them frozen too! I haven’t tried it in a crock pot, so I’m not sure! Let us know how it goes if you do try it! Might be a stupid question, but if you make this ahead, would you just assemble and put in the fridge without cooking? Or would you assemble and cook, and then put in the fridge to reheat the following day? If the latter, how long to reheat and at what temp? You could actually probably do either. It might taste the freshest after cooking and less dry if you don’t cook it first. Either way I would assemble without the crumbs on the top so they don’t get soggy. They will be easy to add right before cooking.